The previous two volumes (on Jesuits as teachers and as builders of the nation) were published in 2015. Jacques Monet, S.J.–the director of the Canadian Institute of Jesuit Studies–served as the executive editor of the three-volume series. 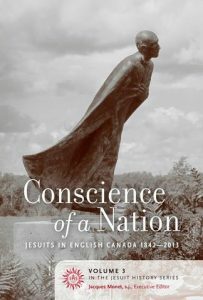 The series is referenced in the essay “Historiography of Jesuits in Canada since 1842” in the Open Access resource Jesuit Historiography Online, hosted by Brill.